Our liquid-applied systems provide seamless waterproof membranes that are easily applied and conform to any penetration shape. This system is ideal when faced with a confined urban space, numerous roof penetrations or restricted use of hot asphalt or heat welding. A protective, reflective coating for built-up, SBS and APP modified bitumen, metal, corrugated and tin roofs. Use: Used as a protective, reflective coating over built-up, SBS and APP modified bitumen roofs and approved substrates. Type: One-part, aluminum pigmented roof coating. Substrates: Metal, corrugated, and tin. Features: Pure aluminum pigment flakes. Highly reflective. Fiber reinforced. Durable. Use: JM PMMA Primer All-Purpose serves as a primer for the JM PMMA system. Combined with JM PMMA Catalyst, it forms a flexible combination primer for membrane, cement board, concrete, masonry, wood, and other substrates (as recommended). JM PMMA Primer All-Purpose promotes adhesion and reduces staining on applications that contain residual or existing asphalt systems. Type: Elastomeric, liquid-applied membrane primary layer. Features: Promotes adhesion on concrete, masonry, wood, asphalt and various surfaces. Suitable for ponding water areas. UV stable, high solids, VOC compliant. For use with JM BUR and SBS membrane products. JM PMMA Catalyst is a reactive agent used to initiate curing of JM PMMA liquid resins and primer. Use: For use with JM BUR and SBS membrane products. JM PMMA Catalyst is a reactive agent used to initiate curing of JM PMMA liquid resins and primer. Type: Catalyst for two-part, elastomeric, liquid-applied PMMA systems. 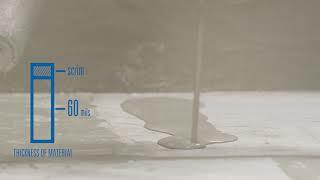 Use: JM PMMA Cleaner is used to clean and reactivate the transition area between existing, cured in-place JM PMMA membranes and primers and new tie-ins, repairs and staged coats of resin. This product may also be used as solvent for cleaning metal and plastic surfaces prior to resin application as well as tools and equipment used with the application of the JM PMMA system. Features: Prepares fully cured and existing JM PMMA membrane and primers for a new application of fresh resin. Use: For use with JM BUR, SBS and JM PMMA membrane systems. JM PMMA Detailer combined with JM PMMA Catalyst to form a rapid-curing, flexible polymethyl-methacrylate (PMMA) resin containing chopped fiber reinforcement. Used in areas where fabric reinforced flashings would be difficult to install. Do not install in areas where differential movement is expected. Type: One part of a two-part, elastomeric, liquid-applied flashing material. Features: Can be used to flash or repair small areas that cannot be reinforced with fabric. UV stable, high solids, VOC compliant. JM PMMA Field Resin is part of a two-component, fast-curing, polymethyl-methacrylate (PMMA) system for roofing and waterproofing application. It is combined with JM PMMA Catalyst and JM PMMA Scrim to form a monolithic reinforced membrane. Use: JM PMMA Field Resin is part of a two-component, fastcuring, polymethyl-methacrylate (PMMA) system for roofing and waterproofing application. It is combined with JM PMMA Catalyst and JM PMMA Scrim to form a monolithic reinforced membrane. Type: One part of a two-part, elastomeric, liquid-applied membrane. Features: Elastomeric and monolithic. Suitable for ponding water areas. UV stable, high solids, VOC compliant. Available in Summer and Winter Grade. May be combined with JM PMMA Thixo for use on vertical flashings. For use with JM BUR and SBS membrane products. It is combined with JM PMMA Catalyst and JM PMMA Scrim to form a monolithic, self-reinforced flashing membrane for penetrations and a variety of other details. Use: For use with JM BUR and SBS membrane products. It is combined with JM PMMA Catalyst and JM PMMA Scrim to form a monolithic, self-reinforced flashing membrane for penetrations and a variety of other details. Features: Can be used to flash most penetrations, drains, and vertical surfaces. Resists virtually all factors affecting base flashing performance while providing superior flexibility and durability. UV stable, high solids, VOC compliant. Available in a Summer and Winter Grade. This product serves as a primer for a JM PMMA system. It promotes adhesion for various metal substrates, including drain bowls and edge metal. Use: This product serves as a primer for a JM PMMA system. It promotes adhesion for various metal substrates, including drain bowls and edge metal. Type: One part liquid-applied flashing primer. Features: Can be used to prime various metal substrates for a JM PMMA system. For use with JM PMMA membrane systems. It is combined with JM PMMA Catalyst to form a rapidcuring, flexible resin for repairing substrates or covering insulation joints prior to installation of a JM PMMA system. Use: For use with JM PMMA membrane systems. It is combined with JM PMMA Catalyst to form a rapidcuring, flexible resin for repairing substrates or covering insulation joints prior to installation of a JM PMMA system. Type: An elastomeric liquid-applied paste. Features: Can be used to cover the joints in insulation boards to prepare them for application of a JM PMMA membrane system. 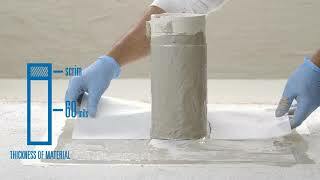 Used for patching or repairs on a variety of substrates. UV stable, high solids, VOC compliant. JM PMMA Scrim is used in JM PMMA liquid-applied, reinforced membrane systems to improve tear strength, puncture resistance, and crack bridging apabilities. It is a non-woven, chopped strand fabric reinforcement. Use: JM PMMA Scrim is used in JM PMMA liquid-applied, reinforced membrane systems to improve tear strength, puncture resistance, and crack bridging capabilities. It is a non-woven, chopped strand fabric reinforcement. For use with JM PMMA membrane systems in high traffic areas such as balconies or walkways. JM PMMA Textured Top Coat is combined with JM PMMA Color Pack and JM PMMA Catalyst to form a flexible resin with pre-mixed aggregate. Use: For use with JM PMMA membrane systems in high traffic areas such as balconies or walkways. JM PMMA Textured Top Coat is combined with JM PMMA Color Pack and JM PMMA Catalyst to form a flexible resin with pre-mixed aggregate. Type: Elastomeric, liquid-applied top coat. Features: Added slip resistance for high traffic areas. UV stable, high solids, VOC compliant. JM PMMA THIXO is used with JM PMMA resin systems as a thixotropic additive. It may be mixed with JM PMMA Resin or JM PMMA Top Coats to prepare the mixture to be used in slopes greater than 1.5":12", including vertical applications. Use: For use with JM PMMA resin systems as a thixotropic additive. It may be mixed with JM PMMA Resin or JM PMMA Top Coats to prepare the mixture to be used in slopes greater than 1.5":12", including vertical applications. Type: One part liquid thickening agent. 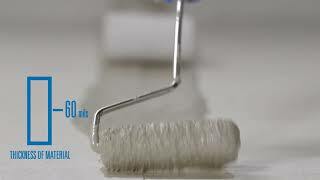 Features: Prepares JM PMMA Resin and Top Coats for use on vertical surfaces. Ideal when JM PMMA Top Coat is needed for vertical surfaces or for when the JM PMMA Resin - Flashing is unavailable or not practical for use. JM PMMA Top Coat is combined with JM PMMA Color Pack and JM PMMA Catalyst to form a UV stabilized, resilient finish top coat. Use: For use with JM PMMA membrane systems. JM PMMA Top Coat is combined with JM PMMA Color Pack and JM PMMA Catalyst to form a UV stabilized, resilient finish top coat. The top coat may be smooth or applied with broadcast aggregate. Features: May be combined with JM PMMA Thixo for use on vertical flashings. JM PMMA Top Coat can be tinted in a variety colors. Check out the full list to make your commercial roof even more unique. One-part, acrylic reflective coating (in white or tan) for bituminous roof systems. Use: As a reflective top coat over a variety of substrates, including smooth or mineral surfaced asphalt-based systems, single ply and metal roofing. Type: One-part acrylic elastomeric roof coating. Features: Asphalt bleed blocking. 100% acrylic durability. Energy savings. Prolonged roof life. Reduced life cycle costs. One-part, acrylic reflective coating (in white or tan) for bituminous or EPDM roof systems. Use: As a reflective top coat over a variety of substrates, including smooth or mineral surfaced asphalt-based systems, single ply and metal roofs. Features: 100% acrylic durability. Energy savings. Prolonged roof life. Reduced life cycle costs. Ideal for all climates, especially cold climates where temperatures may drop below 0F. One-part, acrylic base coating (for TopGard® 4000 or 5000) that acts as an oil-bleed barrier for bituminous systems. Use: TopGard Base Coat is used over a variety of substrates, including smooth and mineral surfaced asphalt-based roofing systems and single ply. It provides outstanding bleed-blocking over hot asphalt, asphalt emulsion systems, and both modified and built-up roofing systems. TopGard Base Coat must be used as a base coat in concert with TopGard 4000 or TopGard 5000. Type: One-part acrylic elastomeric base coating. Features: Can be used within 24 hours of roof membrane installation. Prolonged roof life and reduced life cycle costs. Renewable. One-part, reflective, asphalt emulsion roof coating with aluminum flakes and reinforcing fibers for bituminous roofing systems. Use: As a reflective coating for smooth-surfaced built-up roofs, and can provide a UL® Class A rating in certain constructions*. Type: One-part roof coating that is a combination of aluminum flakes and non-asbestos reinforcing fibers suspended in an emulsified asphalt. Substrates: Built up, SBS and APP modified Bitumen roofs, metal, concrete, stucco and masonry. Features: Provides a layer of weathering asphalt and excellent reflectivity in a noncombustible roof surfacing.